Commercial & Domestic Pest Technicians Middlesex UB | Quality Property Care Ltd.
Say goodbye to pests! And say hello to our understanding, polite and English-speaking pest management technicians from Quality Property Care Ltd.. Book a professional visit on 020 3746 4287. Our kind consultants are available for you. We work all year round with no exceptions for bank holidays and weekends! Quality Property Care Ltd. offers a full range of domestic and commercial pest control services in Middlesex UB. They include crawling and flying insect inspections and treatment, as well as stopping the entrance ways, trapping and removal of rodents and other unwanted wildlife. The pest professionals are accredited by pest control agency and have passed training courses for efficient and safe use of various insecticides, traps, baits and pesticides. We offer a guaranteed pest control service, which includes 2 follow up free visits by pest control inspector as well as a one off procedure. The services we deliver are: treatment, prevention and inspection of pest infestations. Food attracts ants and makes them come into your property . The experienced pest control specialist from Quality Property Care Ltd. has to identify the entrance point, find the nest and eliminate the food source that is attracting the ants. A thin layer of special solution is put into the ants' path. They drag it into their colony which kills not only the workers but the entire population. Their entrance to your home is plugged and the problem is resolved. You should avoid leaving food leftovers for a prolonged period of time or the ants will appear again. Flying insects are quite a problem, especially during the spring and summertime. Bees and wasps are a common domestic problem in rural areas and some parts of London. We have a proven way of treating them. We will not exterminate the bees but will relocate them with the consultation of a beekeeper in the region. They are protected species and make honey. Wasps on the other hand are aggressive and sting multiple times. After the wasp hive has been found, our professional pest control technician sprays it with a special poison. This puts the wasps to sleep and the hive can be easily removed. We get all of our supplies and equipment from certified suppliers in the UK specialised in PEST control related materials. With our many years of experience, a team of specialists and the proper pest control methods, we guarantee no more pests, satisfactory results and no hassle. We will remove ants, bedbugs, cockroaches, woodworms, fleas, silverfish, dust mites, wasps, rodents, squirrels, moths, rats, flys, pigeons, bees and more. 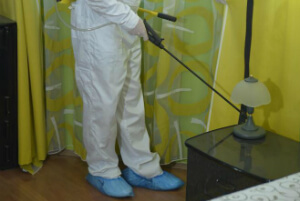 The pest control service is faster and easier if the infestation is small enough and you have called soon enough. However, if the rats have already made a nest, we need to approach with a more harsh solution. Our pest experts identify their entrance points, then remove any food leftovers and plug the access points into the property. To catch the rodents the pest control professionals use non-lethal traps and glue pads with decoy food on them. The traps can sit for 2-3 days. If you’ve booked a follow up procedure the technicians check to see how effective the traps were and remove the pests from your home or office. Otherwise, you might have to do that yourself. You can arrange your expert pest control service right away by calling the phone 020 3746 4287 or sending an online booking request. The customer assistants will come back to you as soon as possible and send you a email confirmation. If you are really worried about your pest problem and want to get rid of it immediately - there is an emergency service available, so call now. No deposit necessary. You will pay after the job is done. Book a guaranteed pest control service and get 2 free follow up pest control treatments and visits. Book today!